A front-page Daily Express story claiming that English was starting to "die out" in some British school classrooms was inaccurate, press regulator IPSO has ruled. Jonathan Portes complained about the front-page story from 24 July, headlined “311 languages spoken in our schools”. The sub headline read: "Special investigation: classrooms where English is starting to die out." The online version said: “311 languages [are] spoken in our schools as English starts to die out”. It reported that English-speaking pupils are “becoming a minority in hundreds of classrooms”, that in some schools English is “hardly heard at all”, and that there are schools where “foreign languages have overtaken English”. It said this was due to a“decades-long open door policy on immigration”, and referred to data obtained from the Department for Education. IPSO said in its ruling that the article "made clear assertions of fact that English 'is starting to die out' in schools and that English was 'hardly heard at all' in some schools. These claims distorted the data cited by the newspaper, which did not include any information about the frequency with which English was spoken in schools, by either pupils or teachers. "This was a particularly concerning case because the inaccuracies had been repeated throughout the entire article, including prominently in print in the front-page sub-headline, and because they were central to the report, on a matter of significant public importance." It said that a proposal from the Express to correct the story on its letters page was inadequate. It said: "The article’s central claim – which was both dramatic and significant – was substantially undermined by the inaccuracies and the newspaper had failed to comply with its obligations under Clause 1 [of the Editors' Code] to correct it. In such circumstances, a reference to the adjudication must be published on the front page, directing readers to the full adjudication, which should be published on page seven. "The front-page reference should include a headline making clear that IPSO has upheld the complaint, and refer to its subject matter; it must be agreed in advance. It should also be published on the newspaper’s website, with a link to the full adjudication appearing on the homepage for 48 hours; it should then be archived online in the usual way." Following the publication of an article in The Daily Express on 24 July 2015, headlined “311 languages spoken in our schools”, Jonathan Portes complained to the Independent Press Standards Organisation that The Daily Express had breached Clause 1 (Accuracy) of the Editors’ Code of Practice. The complaint was upheld, and IPSO required the newspaper to publish this adjudication. The front page article reported that English “is starting to die out” in schools. It also reported that there are some schools where English-speaking pupils are “becoming a minority”; where English is “hardly heard at all”; and where “foreign languages have overtaken English”. The article said that this was taking place due to an “open door” immigration policy, and referred to Department for Education (DfE) data about specific schools in relation to these claims. The complainant said that the article’s central claims were inaccurate. It also inaccurately suggested that in some schools, lessons are not taught in English. The data referred to by the newspaper only recorded a pupils’ first language; it did not say that those pupils would be unable to speak English. Further, English is the language of instruction in all maintained schools in England. The Daily Express accepted that the article may have suggested inaccurately that pupils who did not speak English as a first language could not speak English at all, and that English is not spoken in some classrooms. It said that when reading the article as a whole, the inaccuracies would not have significantly misled readers. It offered to publish a correction both online and in its “Amplifications & Corrections” column on its letters page. The Complaints Committee found that the article’s claims that English “is starting to die out” in schools and that English was “hardly heard at all” in some schools were completely unsupported by the data the newspaper had cited. These claims distorted the data cited by the newspaper, which did not include any information about the frequency with which English was spoken in schools, by either pupils or teachers. This was a particularly concerning case because the inaccuracies had been repeated throughout the entire article, including prominently in the front-page sub-headline, and because they were central to the report, on a matter of significant importance. The newspaper’s defence that the article was not misleading when read as a whole did not demonstrate that the newspaper had taken care to report the data accurately. The complaint was upheld as a breach under Clause 1. 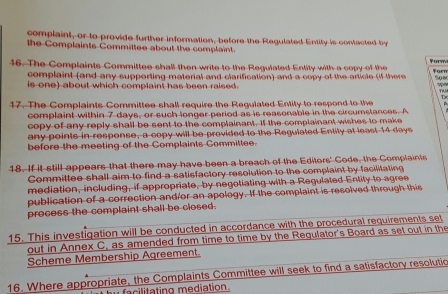 The Committee was also concerned by the newspaper’s proposals to correct the inaccuracies in its “Amplifications & Corrections” column on its letters page. There was no information published on this page to signal to readers that this was where the column would normally appear, and the column itself was published infrequently. Given its position in the newspaper, the letters page was not an otherwise sufficiently prominent location for the proposed correction, since the article had appeared prominently on the front page. This aspect of the complaint was also upheld under Clause 1.